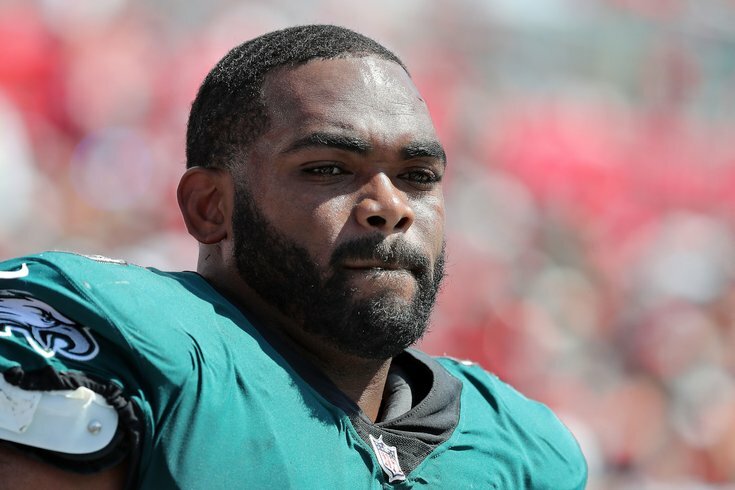 The under-appreciation of Brandon Graham continues. #JimmySays: Barnwell generally did a good job trying to understand the context of each of the Eagles' moves. He objected to Darby's $8.5 million price tag, which he no doubt wrote that at a time before the "real" numbers came out. It's more like a $5.6 million deal, with incentives. I'll object to the notion that Graham got overpaid, but we'll get to that in a minute. The cap-strapped Philadelphia Eagles entered free agency just trying to hold on for dear life. With little money to spend, they had to decide which members of a large group of pending in-house free agents were worth prioritizing. They brought cornerback Ronald Darby back on a cheap one-year deal, wisely let good-not-great off-ball linebacker Jordan Hicks leave for big money elsewhere and brought back DeSean Jackson for less than the departed Golden Tate received from the Giants. They also got younger up front on defense by effectively swapping out Michael Bennett with Malik Jackson. None of these victories are large, but a win's a win. Malik Jackson could become a negative if he's declining as his 2018 numbers in Jacksonville would suggest. And with Bennett gone, they overpaid Brandon Graham, who brings plenty of pressure but isn't a finisher. They've also yet to address their running back depth chart, which has become a major weakness of late, and they have a hole at left guard that remains unaddressed while they focused on patching up their own house. They have enough wiggle room to pull the trigger on a deal for a running back like LeSean McCoy, Jerick McKinnon, Duke Johnson or Jordan Howard, and they have three top-60 draft picks with which they can address needs at guard, defensive end and potentially even left tackle (assuming Jason Peters isn't Benjamin Button). #JimmySays: Oof. Where do I begin? • Malik Jackson replaces Timmy Jernigan, not Michael Bennett. Graham got significantly less money than Trey Flowers and Za'Darius Smith, two others players whose sacks numbers won't wow anyone (Flowers averages 5.3 sacks per season over his four-year-career, while Flowers averages 4.6), but were more expensive because they're younger. In the same piece, the Lions and Packers are praised for the signings of those two players. What exactly should he have been paid relative to the other edge rushers on the open market? • Hole at left guard? Huh? They re-signed their starting 25-year-old LG to an extremely team-friendly deal. Who exactly should they have signed instead? #JimmySays: Jernigan would have been gone no matter what the Eagles' cap situation was. Grade for Eagles: B+. After trying for years to find a DeSean Jackson-type to replace the receiver who was unceremoniously dumped by former coach Chip Kelly in 2014, the organization did the right thing and just brought Jackson back to the fold (they also gave him a new three-year deal). Jackson led the NFL in air yards per target last year, with 19.1. That's well ahead of the No. 2 receiver, the Jets' Robby Anderson (16.5), among receivers with at least 50 targets. Grade for Buccaneers: C. I mean, the fact that Tampa got anything for a player who was probably going to be cut loose anyway should be seen as a victory. Jackson and the Bucs had some nice times over the past two seasons (he posted a league-high 18.9 yards per catch last season), but the pairing never really lived up to its potential. Grade for Patriots: A. This is a typical Patriots move right here. After losing Trey Flowers to free agency, they complete a cost-effective transaction to actually improve. How is this possible? What's interesting to note here is that since 2014, only Khalil Mack and Von Miller have been better than Bennett at rushing the passer among edge rushers, according to Pro Football Focus; Bennett generated 374 pressures in that span, behind Miller's 405 and Mack's 386. Grade for Eagles: C. From 2009 to 2017, Bennett split his time between the Bucs and Seahawks, but now, after one year in Philly, he's on to another new team -- the 33-year-old is at the mercenary stage of his NFL career. Bennett not only wouldn't take a pay cut to stay with the Eagles, but he wanted a raise. So even though they're losing a player who recorded nine sacks last season, this move did make some sense for them.